When I put this outfit on yesterday for a casual look at work, I wasn’t very comfortable wearing it. The student dress code is no colored jeans. I really try to be an example and not give them a reason to break the rules but it was a testing day and I had to spend 3 hours in one class so comfort won. I did run back and forth to my closet about 10 gazillion times trying to decide if I was going to be brave and walk out the front door. After I did and saw my reflection in the side of my truck I was pretty pleased with myself. One reason is it took me a long time to appreciate my long legs, curves (YES, I think I have curves for a skinny girl! ), and small waist. I know what you are thinking. Some folks would kill to have what I didn’t initially appreciate but that’s a part of my growth process. I also have accepted the fact that I have big eyes but my lashes are killer (bats them as I type). Unfortunately, I looked ashy and washed up on these photos and no amount of editing made me look better so I chopped my head off. I lost a few pounds over the summer. My Granny’s death knocked the wind out of me and I wasn’t able to/did not function very well for two months. I’m working on eating healthy and gaining the pounds back but overall I’m pleased with the Creator’s design. If nothing else, I hope my students always see a lady who dresses appropriately. 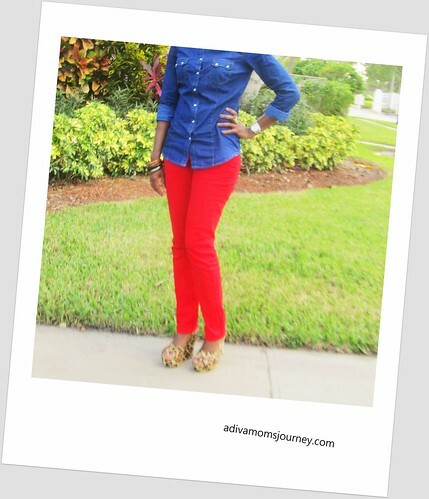 My readers see a real life mom who just happens to love fashion and the color red, blue and green. I don’t want to post any day where I’m putting on airs and not being my true self. 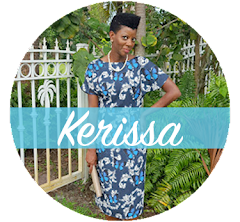 Is there something about you that you’ve come to embrace because you blog or read other blogs? Do share. I’d love to read your comment. I really like this outfit! I'm so glad that you stepped out of your comfort zone and rocked the colored jeans!! I must say that I was like, "Where is Kerissa's head?!" when I first saw the post, but then I read further. lol!! Because of blogging, I have come to embrace my short THICK legs. Shorts were never really high on my list of things to wear before this past Summer. 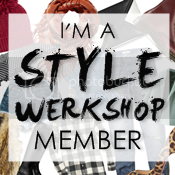 I saw so many of my beautiful thick-legged blogging buddies showing their legs, that I busted out of my shell and did that!! A few times, might I add... and I felt better each time I did it. To live, means to grow. Keep on growing pretty lady! You look great girl!! 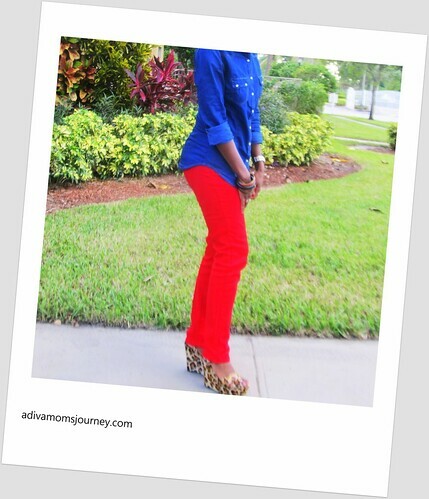 Love the denim and red!! Cute outfit!!! I have learned to embrace my forehead, knees, and arms! You are too funny! lol But your outfit is so cute. I love the colored jeans...I'm all for that. But are you serious? the students aren't allowed to wear colored jeans? That's a first. I think it's crazy that the kids aren't allowed to wear colored jeans! What's the reason? And how many side eyes did you get for wearing colored jeans as a teacher? I'm not used to seeing you in jeans so this look is great. And of course the red is awesome. I rock red almost like a neutral color these days. I've begun to embrace my full lips since I've started blogging. I'm less afraid to experiment with colors now.